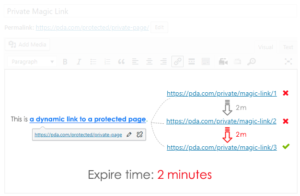 The Private Magic Links extension allows you to embed and dynamically update any private download links of your protected files on your content without having to do any manual work. Shared Private Links: create one expiring download link that dynamically tracks the download limit and expiry for each user, e.g. customers or any user roles of your website. In short, the extension comes in handy when you want to use and embed your private download links directly in your content. Your private download links will expire within a period of time according to your preset settings. 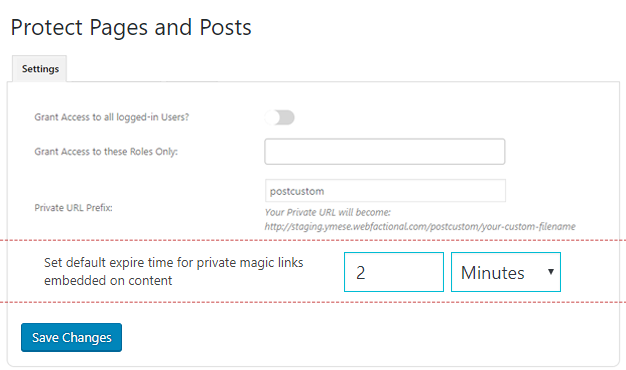 Once they're expired, Private Magic Links extension automatically creates a new private link and update the content for you. No more manual work. 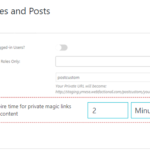 Private Magic Links extension works well with Prevent Direct Access Gold and Protect Pages & Posts Gold. You've embedded a lot of files and images on your content. Now you've decided to protect these files. It's such a pain to go through page by page to update these file URLs to the protected ones. Private Magic Links will search and convert these file URLs automatically without you having to touch anything. 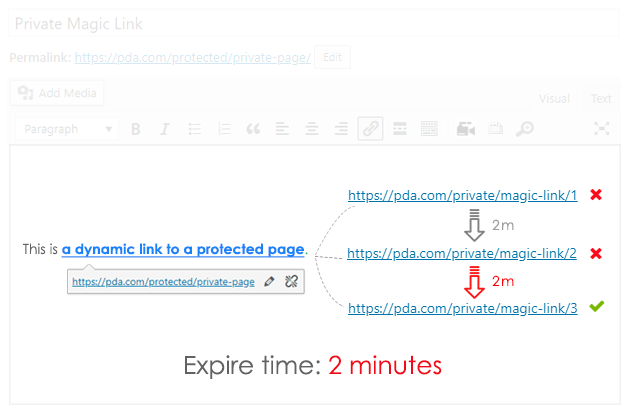 Now your private document link will automatically change and update according to the expire time that you set. This will help stop from sharing the document. You have a private download page that only your subscribers have access to. Short time subscription: Your customers will be able to access exclusive content such as training videos for 7 days after they place their order. Use WooCommerce Integration extension to insert your desired content into WooCommerce completed order email the use Private Magic Links to expire your private page link after 7 days. Your extension license is tied to either your Prevent Direct Access (PDA) Gold, PDA S3 or Protect Pages & Posts Gold's license. So please use the same email when purchasing these plugins and this extension.